There are at least 1800 known species of starfish, and they occur in all the Earth's oceans (never in freshwater). The greatest variety of species is found in the northern Pacific, from the Puget Sound to the Aleutian Islands. Most starfish have five arms, but a few species have more, as many as fifty arms. These bottom-dwellers play crucial roles in the ocean ecosystem: as prey when they are free-floating larvae, and as predator when they reach adulthood. 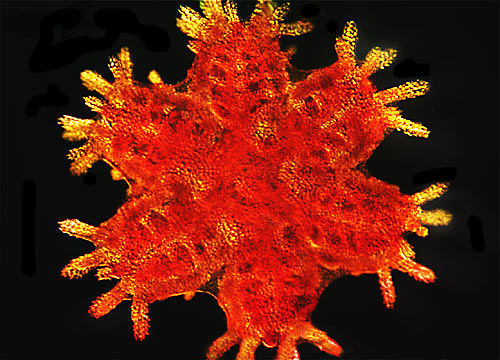 Few animals eat adult starfish, which are apparently neither palatable nor nutritious.